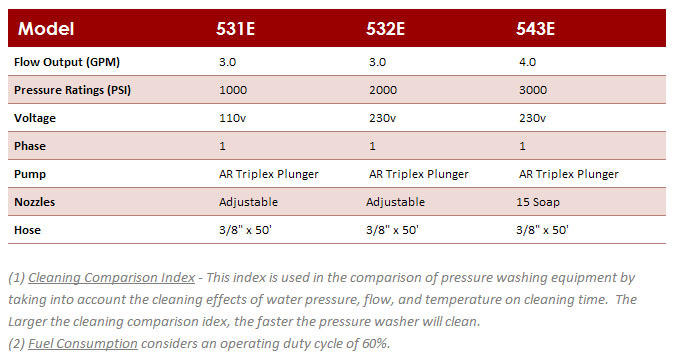 Cold Water Electric Direct Drive Cold Water Electric Washers With 1000 to 3000 PSI and 3 to 5 GPM, these units are designed for a variety of cold water cleaning jobs. The Electric model is powered by a Baldor motor. They are matched with AR or Comet Pumps to provide smooth and constant operation. 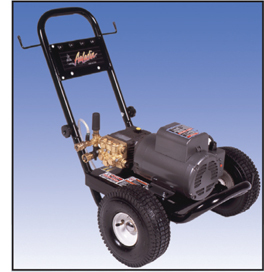 These pressure washers have low pressure chemical injection and come with 3/8" high pressure hoses, trigger control gun, and up to four quick couple nozzles (the Model 531E has an adjustable nozzle) for the best cleaning results. The heavy duty welded tube frame is powder coated with pneumatic tires, build-in nozzle holders, gun holder, and hose hanger. The pressure washer handle has been lengthened for easier use and removes eaily for transportation in confines space. These pressure washers are preassembled requiring only a simple two bolt installation of the handle and are packages in a carcdboard box suitable for reshipping.